Is competitive gymnastics still fun for you? Or has your enjoyment for the sport been replaced with the feeling of work? Having fun is critical, not just as a part of your athletic experience, but for success in the sport. The erosion of fun is a shared experience among gymnasts as they progress up the ranks. Quinn W. is a young gymnast who lost her zest for gymnastics. When Quinn was young, she looked forward to going to practice. Every part of practice was fun from bouncing on the trampoline to doing round offs on the mat. As Quinn advanced, she was excited to learn new apparatuses. Quinn loved competition and was excited the day before knowing she had the opportunity to strut her stuff and hang out with her friends on the team. After a few years, her feelings about competition changed. Pressure, apprehension, anxiety and fear replaced what was once fun and excitement. Rather than giving it her all in competitions, Quinn just wanted her routines to be over as soon as possible. Quinn’s performances routinely fell short of her expectations and she would be very critical of herself for hours after the competition. Overall, Quinn’s experience in gymnastics was now miserable and it definitely affected how she competed. What causes the fun to disappear for some gymnasts? 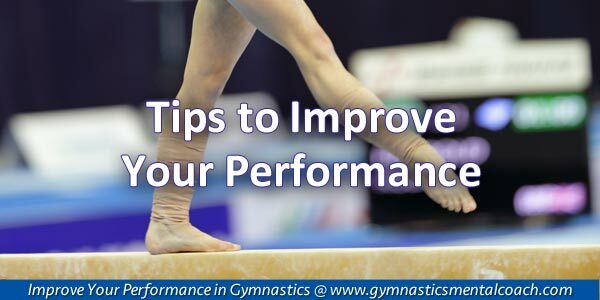 The answer is that when gymnasts become perfectionists and over-focused on results, they experience more pressure which takes some of the fun out of the sport. Everyone likes play. Play focuses on what you are doing in the moment without judgment or expectation of a specific result. Here lies a different form of fun, the fun of overcoming challenges, learning new skills, mastering routines, accomplishing goals. Even though there is an element of results in this mindset, the fun of meeting challenges is still present-moment oriented. Of course, you would be sad if you score low on your best event. The challenge lies in how to be better the next time you perform it. Maryland women’s gymnastics team has rediscovered that youthful fun and excitement despite a 1-4 record this season. The Terps celebrated their best performance of the season even though the team came up short against to Penn State recently. Nee said the team infused fun into their experience by watching movies together, singing and dancing. These activities keep the mood lighthearted during road trips and help the team focus on the process. That fun translated into less pressure and improved performance. If you can rediscover your “fun,” your enjoyment, enthusiasm and performance will ignite. Examine “why?” What are the reasons you started in gymnastics? Were you being goofy with your teammates? Were you thinking of some funny things that happened during the week? Were you dancing crazy during warm-ups? If you know what makes you enjoy your sport, you can replicate those experiences for future meets. Make it a goal to have more fun in gymnastics–instead of the need to be perfect with your skills! Learn all my mental game strategies for improving your performance via mental training in my CD and Workbook program for competitive gymnasts. 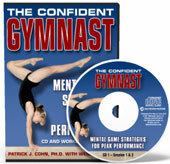 The Confident Gymnast is a complete brain dump of the TOP 8 mental training sessions we teach our gymnasts to help them boost their mental game and improve consistency- from how to mentally prepare for compeition to perorming under pressure to building unstoppable confidence. 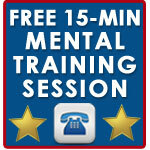 What are mental coaching students saying? Are you a perfectionist? What is your mindset when performing? 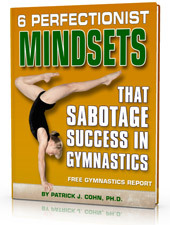 Download our FREE gymnastics mental training report! I really appreciate your mental game tips. It is very informative and useful, helped my game so much.